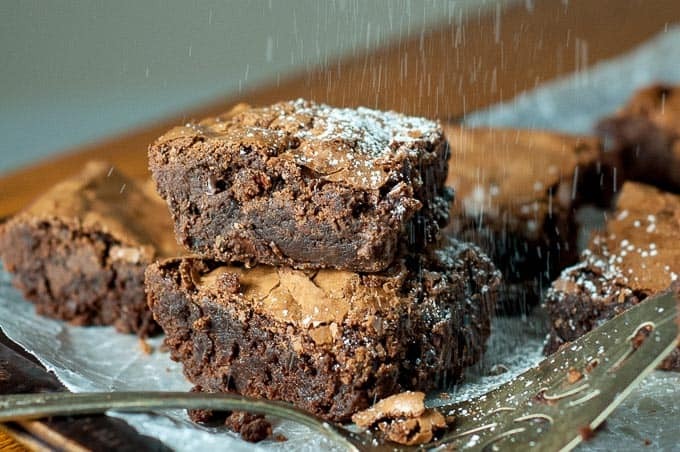 Easy Homemade Brownies are an essential recipe to have. 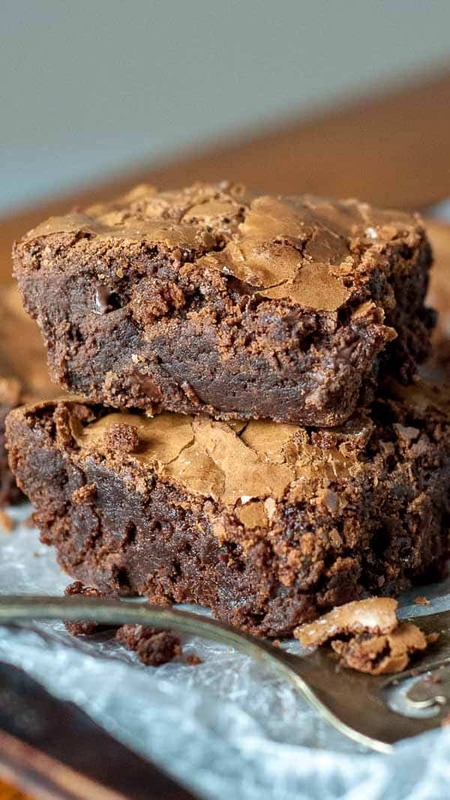 This best ever, go-to brownie recipe from scratch are quick and easy to make with a chewy crust, fudgy center, and crackly top layer. I was raised in a large family with two mottos…There’s always room for one more on the couch, and there’s always room for dessert. In fact, as soon as our dinner forks were set down, dessert was being whipped out. We are a conglomeration of dessert die hards so I’ve made, sampled, and critiqued my fair share of brownie recipes from scratch. Most recipes never got a second shake, and while some were revisited, I still felt as if my perfect brownie match was still out there. Then I stumbled upon the MOTHER OF ALL BROWNIE RECIPES and immediately ceased my lifelong search. I could finally STOP LOOKING for the perfect EASY HOMEMADE BROWNIE RECIPE. Why are the best homemade brownies in the world? Fudgy overload – If you want a cakey brownie, you’ve come to the wrong place. Crackly crust – Is there nothing better than a thick, gooey middle with a thin sheet of crackle on top?! They make a 9X13 pan. You can half the recipe for a 8X8 pan, but you need to take a hard look at why you’d want less brownies. This brownie recipe uses a reasonable amount of butter. Butter isn’t the cheapest ingredient and no one wants to break the bank on a recipe. Chances are you have the ingredients for this recipe right in your kitchen. No extra trip to the store required! They are crazy easy to make! Interested in what makes brownies chewy, fudgy, or cakey? Check out this article! Brownies are difficult to tell by looks if they are done. However, you don’t want to overcook them to make sure. No one wants to eat hockey puck brownies. It’s best to start checking brownies a few minutes before the recipe’s cooking time. Oven temperatures can vary and exact timing makes a difference while baking. Edges will look and feel set before the middle cooks through. Therefore, stick a toothpick or wooden skewer in the middle to check the batter. If it comes out with wet, uncooked batter, stick them in for a few more minutes and check again. They are done when fudgy, cooked crumbs stick to the toothpick. Yes, and if you want to save yourself from eating the whole pan of these, I highly recommend it. If the brownies are cut and cooled, wrap each individually in plastic wrap and store in a ziplock freezer bag. The whole pan can also be frozen. Make sure the cooked brownies are cooled completely and then wrap the pan in plastic wrap. It’s best to wrap it all the way around, like a present, to get a good airtight seal. Then cover the top with a layer of foil. Pull out the pan to thaw on the counter a few hours before serving. Can these Easy Homemade Brownies be made gluten free? Yes, and they are still fantastic! In fact, no one will know they are gluten free. The trick is to substitute a great all-purpose gluten free flour mix. My absolute go to is Cup 4 Cup gluten free flour. I substitute it in EVERYTHING and it always delivers with fabulous, tasty results. Melt together butter, sugar, and a bit of water. Once melted, remove from heat and add chocolate chips. Stir until chocolate melts completely. Cool chocolate slightly then add eggs and vanilla. Finally stir in flour, baking soda, and salt. Pour in greased 9X13 pan and bake. Want to make the World’s Best Brownies even more insane? 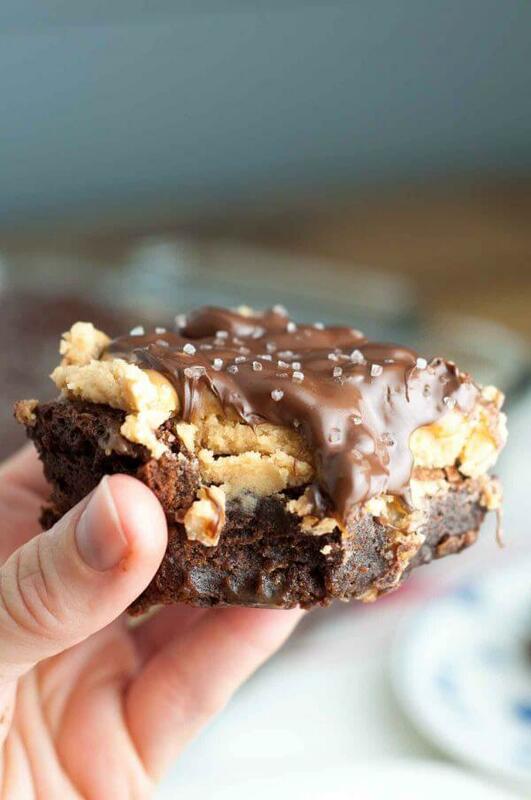 SAVE THESE EASY HOMEMADE BROWNIES TO YOUR PINTEREST BOARD! 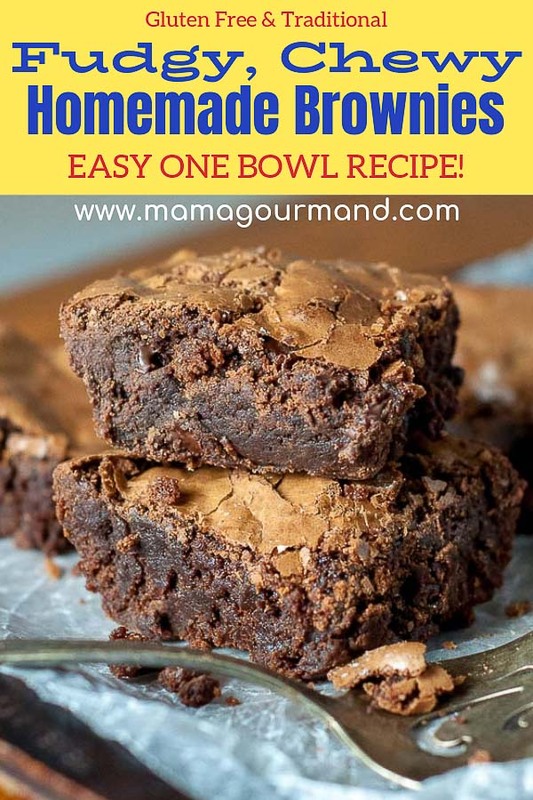 The best Easy Homemade Brownies recipe from scratch are quick and easy to make with a chewy crust, fudgy center, and crackly top layer. Grease a 9X13" baking pan and preheat oven to 325ºF. TIP: I find baking brownies in a metal pan makes them fudgier with chewy crusts. In a large saucepan combine the sugar, cubed butter, and water. Bring to a boil, stirring constantly. Immediately remove from heat and stir in 2 cups chocolate chips until melted. Cool slightly, about 10 minutes. Whisk in eggs and vanilla vigorously into chocolate mixture. Pour into prepared pan and bake for 35-40 minutes, or until toothpick inserted in center comes out with a few fudgy crumbs. Cool in pan on wire rack. You can easily half this recipe if you only need a 8X8" pan. The cooking time may decrease a few minutes, so start checking about 10 minutes before. Yummy yummy yummy is all I have to say!! These are the best brownies! And so easy. Thank you, thank you, thank you. I’ve made these brownies WAY too many time times, but they never disappoint! You can of half the recipe for 8×8 pan. On the recipe notes there are baking instructions. Enjoy! I made this recipe and was completely blown away by how awesome they were! I will never use a brownie mix again. I’m wondering if it’s possible to use unsalted butter instead of regular butter though…. would that change the taste/texture at all? 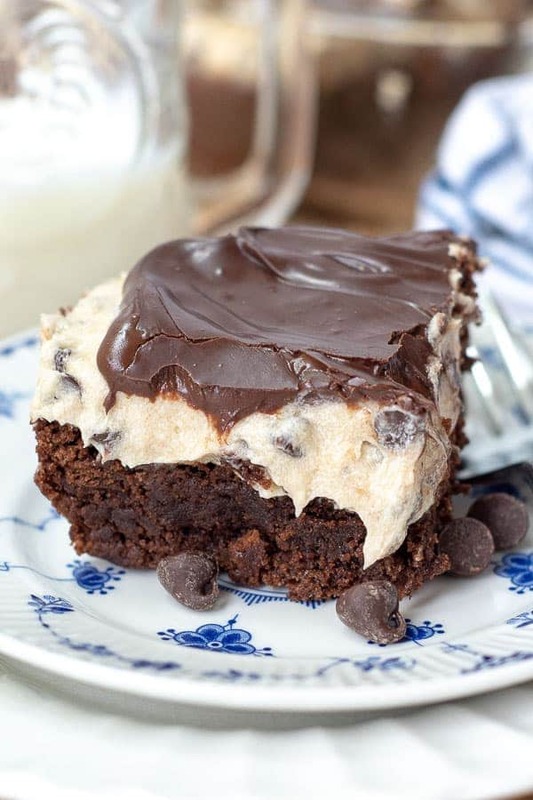 I just made these as the base for the Buckeye Turtle Brownie recipe and they did not turn out. I was a cup short on chocolate chips, so I used 2 Tbs. cocoa powder instead. They are way too dry (seems like 4 cups flour is too much), they rose very high in the glass pan (at least twice the batter height), and just didn’t have a very rich flavor. Probably my substitions and the fact I live at 6,000 ft. I also may not have beat the eggs well enough or dissolved the sugar all the way as you mentioned (wish I’d read the comments before making). I’m bummed, because I was so excited to make the Buckeye recipe, which still turned out okay despite the brownie failure. I will definitely make again, just using the Giradelli triple chocolate brownie mix that I love to ensure they turn out great. Ok, I just reread the recipe and see that it calls for 1.5 cups flour. I feel so silly! I confused the Cup 4 Cup brand you recommended for 4 cups if flour! So sorry. I’ll have to try again sometime to get it right. Hi there. I am a brownie fanatic and when I stumbled upon your recipe, I knew I had to try it. I made these last night. Although they did indeed come out decadent and dense, I didn’t get that crunchy crackly crust that you did. My crust was the paper thin shiny crust. How long did you beat your eggs? I cant wait to make these again, but I want the crust as shown in your picture. thank you!!! thank you Melissa. do you know that I have tried over 47 brownie recipes trying to recreate my favorite recipe that I lost years ago? Ok well, I shall try your recipe again. thank you for responding!! ok, well, I just made another batch. they looked so beautiful when I took them out of the oven. They had that nice crust just like yours. Now, 15 minutes later, the crunchy crust has turned into a thin flaky crust. Ughhhh. I’m wondering since its so humid right now, if that has anything to do with it. I’m stumped why the crust turned. Like you said, it is quite possible if they were sitting out in lots of humidity. Did you use a metal baking pan? I feel like that gives a better result than glass. You have no idea how much I wanted this recipe to hit it out of the park for you. Don’t give up!